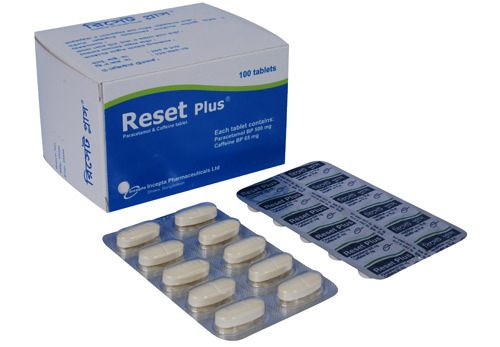 Reset Plus: Each tablet contains Paracetamol BP 500 mg & Caffeine BP 65 mg.
Reset Plus (Paracetamol & Caffeine) is a fast acting and safe analgesic with marked antipyretic property. It is specially suitable for patients who, for any reason, can not tolerate aspirin or other analgesics. The presence of Caffeine increases the effectiveness of Paracetamol. Adult: 1 - 2 tablets every 4 to 6 hours. Maximum dose 4 gm (8 tablets) daily. Side effects of paracetamol are usually mild, though haematological reactions including thrombocytopenia, leukopenia, pancytopenia, neutropenia, and agranulocytosis have been reported. Pancreatitis, skin rashes, and other allergic reactions occur occasionally. Paracetamol & Caffeine should be given cautiously in the following cases: In patients with hepatic or renal failure, in patients taking other hepatotoxic medication. Prolonged use of the drug without consulting a physician should be avoided. Pregnant mothers should consult with doctors before taking Paracetamol & Caffeine. Paracetamol & Caffeine can be taken whilst breast feeding.